This was my first group trip to Pattaya, Thailand, as a reunion with two of my gay besties. 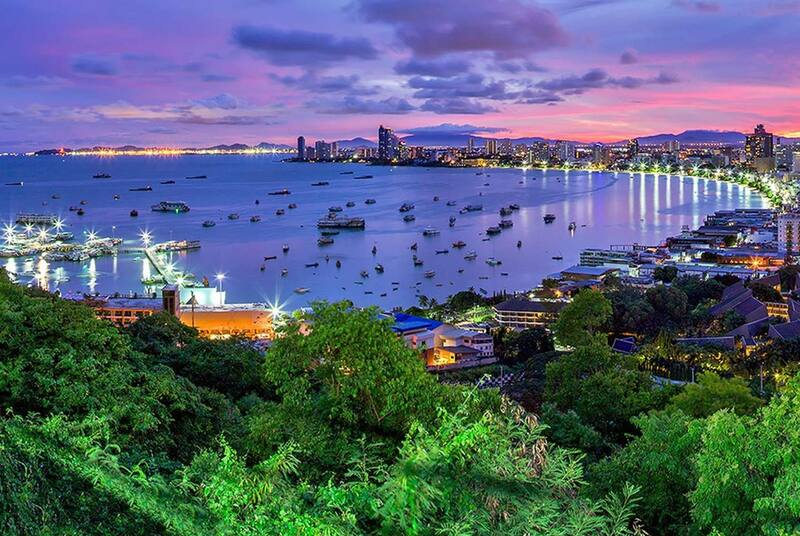 Pattaya is a natural destination for LGBTQ travelers. It offers a resort feeling, is close to Bangkok and has a nightlife that rivals Silom in Bangkok. This was our first road trip together in at least 10 years. Oh wait, where are my manners? Let me introduce myself. I am Ben, and I was born in Lampang, a very cute town near Chiang Mai with mountains, elephants and horses. I follow a strict lifestyle of 3F’s (Fit, Firm, and Fun) and travel is my passion. My two super fun besties on the road were Chad and Joe. Chad has lived in New York for the past 20 years. Meanwhile, Joe is a very successful businessman in the property market in Northeastern Thailand. Both are single if you are interested. We left Bangkok on Sunday afternoon and drove around 1.5 to 2 hours to reach Pattaya. We took the expressway, which is the most convenient route by car. From Bangkok, you can rent a car, negotiate a rate with a taxi, or take a bus. We checked in to one of the coolest and most chilled hotels in Pattaya, Centara Grand Phratamnak Pattaya nestled close to a palace belonging to the Thai Royal Family. This hotel is located in South Pattaya and is also close to the gay beach. Our stay got off to a great start with a welcome from the general manager of the hotel. The rooms are fab with high-end furniture and decorations. Our room had a balcony with a gorgeous wide open view of the ocean. The hotel has a private beach located just across the street. The breakfast area features a mesmerizing fish tank that lets you watch the fish swimming around while you enjoy your meal – feels like you are sitting inside an aquarium. I highly recommend this hotel. My favorite area of the hotel was the rooftop swimming pool that allows you to look over the ocean while you swim or just lie out in the sun sipping your favorite drinks. There are also sun beds, which I used to help with my not-so-healthy glow, and a gym complete with a personal trainer to either assist or provide eye-candy while you work out. You know, we gay boys love the gym. We planned our following day and enjoyed a well-rested evening in the hotel. The best thing about the hotel overall was the quality of the service given by the staff – very welcoming and friendly. I wish every hotel was able to replicate this standard. After a yummy breakfast (they switch up the menu everyday), we headed straight to the pool for private relaxation, sun, delicious cocktails and lots of laughs. This hotel is definitely a good place if you’re looking for somewhere to chill with your friends or lover. You can see from the pictures that we had a great time, especially Chad, the internet idol among us, who found many photo opportunities for his FB and Instagram timelines. Joe loved it too, loved the pool and we both loved chatting (gossiping) while Chad was off taking selfies. It was a chilled relaxing morning, but that changed in the afternoon when we decided to check out the Cartoon Network Amusement Park! It is the first ever Cartoon Network-themed waterpark with 10 main attractions including the world’s largest aqua playground, located in Bang Saray, close to Pattaya. And is the only one in the world, OMG!! Can you believe it? I was actually over excited to go to this place. I spent far too much time planning which swimsuit to wear. In the end, I went with pink shorts to attract attention. Even though I have a great partner already, it’s only human to want to attract wandering eyes, right??? We loved the Cartoon Network, so many fun things to do and many water theme parks to check out and play. All staff were professional and nice, super clean, and many cute Cartoon Network icons made us feel like we were kids again and that we were inside the television! They even had a show every hour and a wave pool you could attempt to surf. I super recommend this place for any couples or groups bored of Bangkok’s typical scene. This place is also suitable for family fun as well. Here are some of our snapshots. From the pictures, you can see how much fun we had! Well, if you are in Pattaya and just want to hang out, strut your stuff in the water park and chill, go check this place out! The day was fun already but it wasn’t over yet. Pattaya’s gay night life was beckoning. There is one Soi packed with gay bars and show boys. Anyone who would like to enjoy and explore it just go to “Boyz Town” and make new friends from around the world too. We did make some, but let’s not talk about that here. On the second day, our first stop was another Centara Grand Modus Resort & Hotel. This beachfront hotel is located in North Pattaya and just a short drive down in to town is the main gay area. The style feels more like an urban loft with raw ceilings and industrial architecture. I recommend this hotel for anyone who loves to admire Thailand’s architectural heritage which is unique and oozes romance. You and your lover could take a moment here to explore some culture together as well. Adjacent to the hotel is a well-known attraction, “Sanctuary of Truth”. The Sanctuary of Truth is a gigantic wooden construction. It was constructed according to ancient Thai ingenuity and every square inch of the building is covered with wooden carved sculptures. The purposes of decoration with wooden sculptures are to use art and culture as a reflection of Ancient Vision of Earth, Ancient Knowledge, and Eastern Philosophy. Within this complex, visitors will understand Ancient Life, Human Responsibility, Basic Thought, Cycle of living, Life Relationship with Universe and Common Goal of Life toward Utopia. It certainly is one of a many interesting places to visit when you are in Pattaya, especially if you enjoy culture. Or, if you’re into a different kind of romance, you may have preferred our next stop – the fantastic gay scene around Jomtien Beach where the rainbow flag flutters proudly among the beach chairs. There are many bars, coffee shops and restaurants near the beach, not to mention an infinite number of massage shops for when you’re ready to take your relaxation to another level – who wouldn’t?! And there it is, our short 2-day trip together to Pattaya. It is one of the most popular resorts to visit near Bangkok with bars, clubs, beaches, international hotels, and the amazing Cartoon Network water park! Plus for us gays, we even have our own beaches and nightlife too – Go check it out, folks!